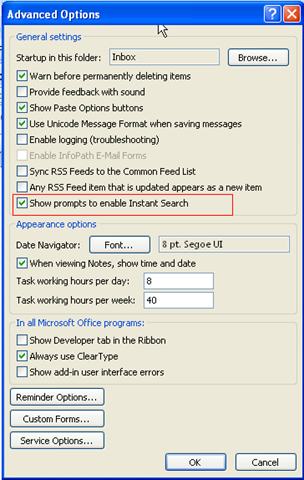 When you install Outlook 2007 for the first time, you are asked if you want to install Microsoft Instant search. if you select yes, then you are redirected to the download page at Microsoft to download the desktop search component which is needed for the instant search feature in Outlook to work. 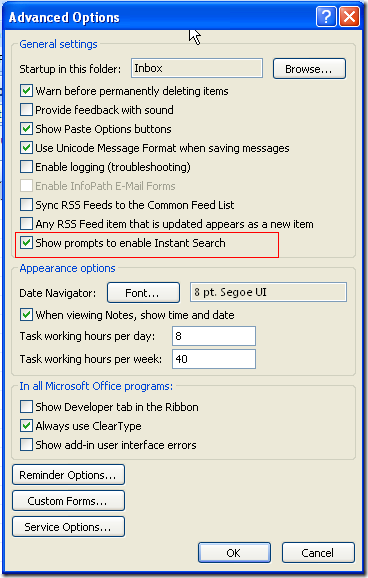 in my opinion the instant search feature is not needed, and it actually drag the performance in Outlook, so when it prompts you at the first time you open outlook 2007 to enable instant search, you should choose NO. after you choose no, outlook docks a small yellow ribbon on top on your mailbox to remind you if you still want to install the instant search feature. that should remove the nagging yellow ribbon.